From Concept To Completion – Hot Day? We have the perfect shade for you! 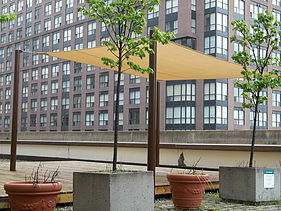 Shade sails can be used in a number of residential, commercial, and industrial applications. They are popularly used in outdoor home areas such as backyards, patios, verandas, barbecue areas, pool-sides, and landings. They are also ideal in public places such as parks, playgrounds, preschool areas, kindergartens, school grounds and amphitheaters. Many recreational areas also take advantage of the benefits of shade sails including golf clubs, sport courts, resorts, and country clubs. Other applications may include wineries, hotels, restaurants, hospitals, parking areas and car dealerships. Shade sails are designed to cover outdoor areas and protect people from the harmful ultraviolet (UV) rays of the sun. The best shade sails offer up to 99% UV protection and 97% shade. With shade sails, almost no harmful solar element can penetrate and damage the skin even on the hottest time of the day. 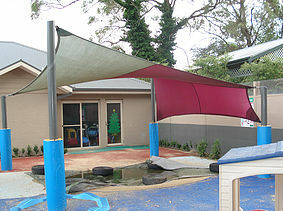 Using shade sails protects people, particularly young children, from getting sunburn and skin cancer. Research shows that over-exposure to sunlight in the first 15 years of life is a significant factor for the development of many types of skin cancer, including melanoma. 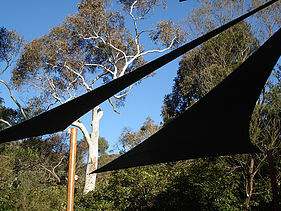 Aside from turning away the UV rays and the hotness of the sun, shade sails also provide ventilation. They are made of breathable materials that allow cool air to circulate in the area they are covering. 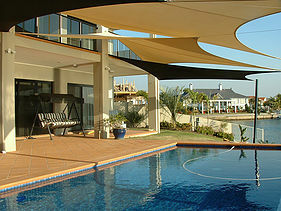 Shade sails usually provide more than 15 degrees of cool atmosphere than ordinary steel roofs can. 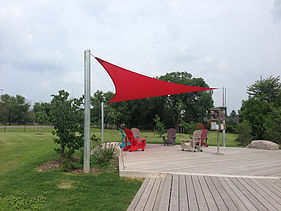 Shade sails add aesthetic value to the areas they cover. With the right design, they can make gardens, patios, and verandas more appealing and welcoming. We customize the shape and design to meet the customers’ preferences and to compliment any outdoor area. We offer a choice of over 20 fabric colours. Not only are you going to be able to protect your children from the harsh rays of the sun, you will also be able to add some visual interest to an outside area. Our custom made sails are manufactured with a stainless steel cable double locked stitched into its perimeter. This cable terminates at a stainless steel ring located at each corner. These rings are then used to fasten the sail by either a shackle or turnbuckle to a hard point either on a post or existing structure. Each corner is further reinforced with extra layers of cloth and strapping to distribute forces. Stitching is tight up to the marine grade 316 stainless steel corner rings preventing the rings from turning. Such fine attention to detail further guarantees the longevity and quality. Best quality UV stabilized thread made in Germany. Excellent long term colour retention, there is a 10 year warranty against UV degradation. All hardware is marine grade 316 stainless steel made in Denmark. 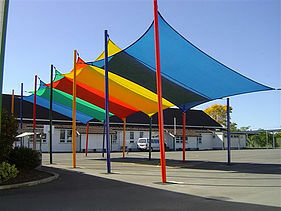 Sails can be attached to existing structures with a variety of common or custom made brackets and hardware. They can also be supported by their own posts made of either timber or steel pipe. We prefer to use schedule 40 galvanized steel pipe embedded in concrete footings. The dimensions of the pipe and the footings are engineered for each sail and its application depending on the size of the sail and the expected wind load. The posts can then be powder coated or painted to help protect them and provide the desired color. Limited to 36 months on installation– refer to terms & conditions. 1.1. All Colourshade & Z16 Decorative Shade Fabric(“Fabric”) is manufactured from high density polyethylene raw materials. During the extrusion of yarns, colour concentrates and ultra-violet stabilisation additives, as recommended by Ciba Speciality Chemicals (Pty Ltd), are added to the raw materials, thus enhancing the life of the fabric against degradation from exposure to sunlight. 1.2. The UV–R and shade percentage specified on all products is measured to the Australian Standard 4174-1994 and will not vary by more than 5% above or below the stated percentage. 2.1. Despite using high quality light fastness and heat stable colour concentrates, there will, over a period of time be colour fading or colour deterioration. 2.2. Depending on location, UV intensity of the sun, moisture and cloud cover, some colours will be more prone to colour fading than others. 2.3. Fading is the process of a gradual loss of colour which starts immediately when the products are exposed to sunlight. The rate at which this takes place is dependant on the conditions as noted in point 2.2. above. 3.1 This warranty is effective from 1st November 1999. All fabric purchased before this date is subject to the original five (5) year warranty. 3.2.1 Rainbow Shade Products give a five (5) year warranty on Colourshade and Z16 Decorative Shade Fabric against UV degradation. Should the fabric disintegrate, crack or break down as a result of degradation caused by the sun, Rainbow Shade Products will replace the affected fabric. 3.3.1 Rainbow Shade Products give a further five (5) year warranty on a pro-rata basis against UV degradation. Should the fabric crack or break down as a result of degradation caused by the sun, Rainbow Shade Products will replace the affected fabric on a pro-rata basis based on their original selling price of the fabric. 3.3.2 The replacement percentage of 100 will be reduced by 20% for every twelve(12) months. 4.2 Rainbow Shade Products liability is limited to the replacement of the affected fabric on the basis set out in 3. above. 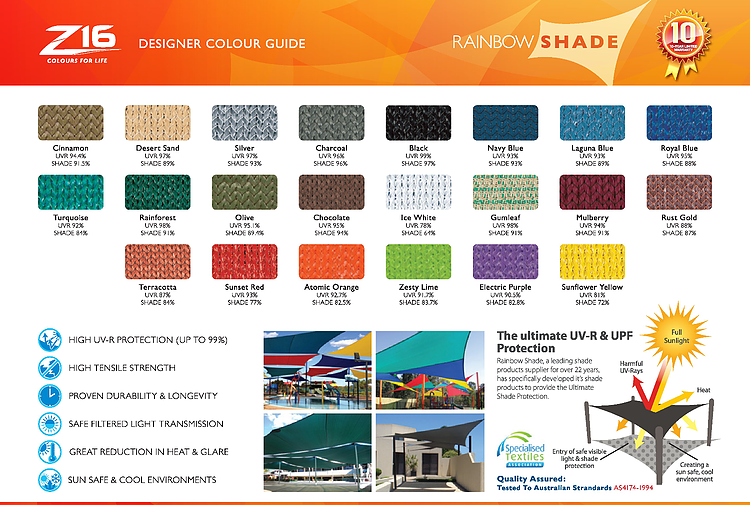 Under no circumstances will Rainbow Shade Products be liable for any consequential or indirect loss including damage to, equipment or other assets, nor for any costs incurred in replacing the affected fabric, including delivery and erection costs. 4.3 Rainbow Shade Products liability is limited to the replacement of the affected fabric on the basis set out in 3. above. Under no circumstances will Rainbow Shade Products be liable for products not manufactured by this company, such as sewing yarns etc. 5.1 This Warranty is the only warranty given by Rainbow Shade Products and any warranty that may otherwise be implied in law is hereby excluded. 5.2.2 Documentary proof of purchase price. 5.2.3 Access by Rainbow Shade Products staff to view the material on site. 5.2.4 Samples of damaged fabric must be returned to Rainbow Shade Products for inspection. 5.2.5 Replacement of fabric is at the discretion of Rainbow Shade Products. All testing has been completed by AWTA Textile Testing. Designed by Managhan Design Solutions | Powered by GSL Technologies Inc.